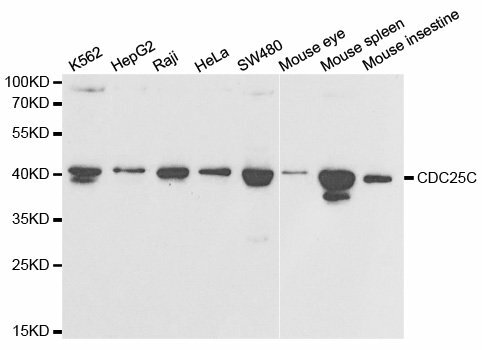 Western blot analysis of extracts of K562 cell lines, using CDC25C antibody. 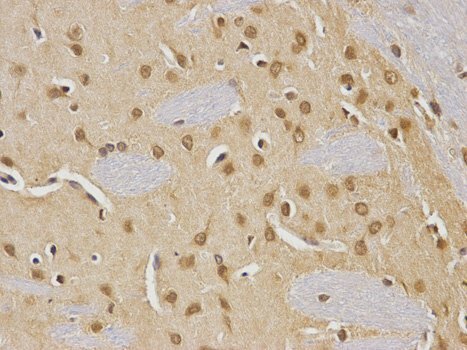 Immunohistochemistry of paraffin-embedded rat brain using CDC25C antibody at dilution of 1:100 (400x lens). Immunohistochemistry of paraffin-embedded rat kidney using CDC25C antibody at dilution of 1:100 (400x lens). 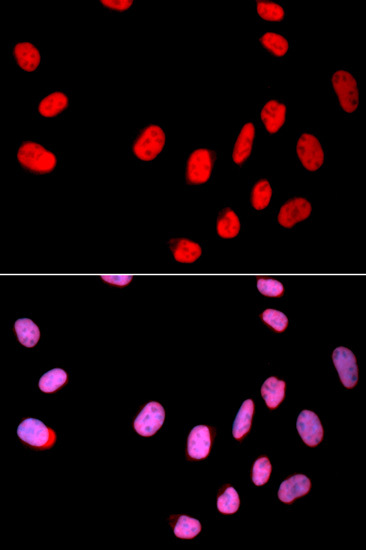 Immunofluorescence analysis of U2OS cell using CDC25C antibody. Blue: DAPI for nuclear staining. PBS with 0.02% sodium azide,50% glycerol, pH7.3. Small volumes of anti-CDC25C antibody vial(s) may occasionally become entrapped in the seal of the product vial during shipment and storage. If necessary, briefly centrifuge the vial on a tabletop centrifuge to dislodge any liquid in the container`s cap. Certain products may require to ship with dry ice and additional dry ice fee may apply. Cdc25 is a protein phosphatase responsible for dephosphorylating and activating cdc2, a crucial step in regulating the entry of all eukaryotic cells into mitosis (1). cdc25C is constitutively phosphorylated at Ser216 throughout interphase by c-TAK1, while phosphorylation at this site is DNA damage-dependent at the G2/M checkpoint (2). When phosphorylated at Ser216, cdc25C binds to members of the 14-3-3 family of proteins, sequestering cdc25C in the cytoplasm and thereby preventing premature mitosis (3). The checkpoint kinases Chk1 and Chk2 phosphorylate cdc25C at Ser216 in response to DNA damage (4,5). NCBI/Uniprot data below describe general gene information for CDC25C. It may not necessarily be applicable to this product. CDC25C: a member of the MPI phosphatase family. Activates the cyclin dependent kinase CDC2 by removing two phosphate groups and it is required for entry into mitosis. Shuttles between the nucleus and the cytoplasm due to nuclear localization and nuclear export signals. The protein is nuclear in the M and G1 phases of the cell cycle and moves to the cytoplasm during S and G2. CDC25B has oncogenic properties, although its role in tumor formation has not been determined. At least four transcript variants for this gene exist. Three splice variant isoforms have been described. 1. the knockdown of CDC25C can reduce both the radiotherapy sensitivity and the proliferation activity of EC9706 cells.